A royal lady joins us in the salon today, a woman born in Vienna who went on to play her part in the story of Brazilian independence. 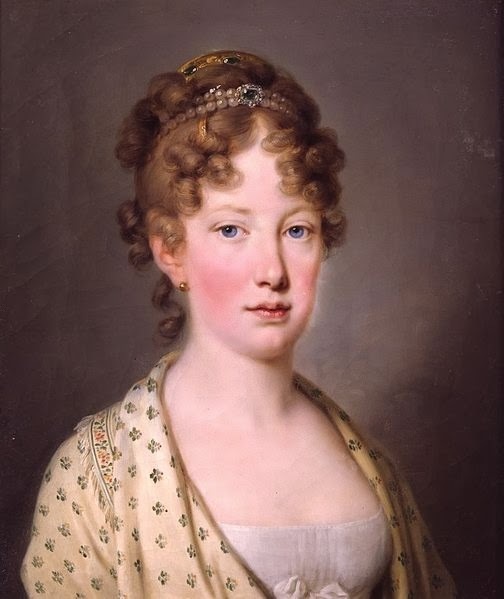 Archduchess Maria Leopoldina was born at Schönbrunn Palace to Francis II, Holy Roman Emperor and Maria Teresa of the Two Sicilies. She was one of twelve children and among her siblings could count Emperor Ferdinand I of Austria and Marie Louise, Duchess of Parma, the wife of Napoleon Bonaparte. As a girl she was dedicated to her studies and developed and abiding and lifelong love of the natural sciences, enjoying a loving and close relationship with her stepmother, Maria Ludovika d'Este, after the death of Maria Teresa when the little girl was just ten years old. When Leopoldina was 18 years old she was informed by her father that the time had come for marriage and that she should prepare to leave for Rio de Janeiro, where she would be wed to Pedro of Braganza. She consented to the match and immediately set about learning as much as she could about her husband and the land where she was to make her new home, concentrating on learning Portuguese so that life at court might be less difficult to settle into. Her studies eventually became a unique journal on the life, culture and environment of the place that would become her home. On 13 May 1817 Leopoldina was married to Pedro by proxy in Vienna, where the bridegroom was represented by the bride's uncle, Archduke Karl. Finally, amid celebration and festivities, she left Livorno for Rio on 13th August 1817, eventually arriving on 5th November. Leopoldina arrived in her new home to find her husband living with dancer Noemie Thierry, who would remain at court for a further month before finally being prevailed upon to depart. The young couple found married life more difficult than they had anticipated yet they settled together in the Quinta Boa Vista in São Cristóvão. Their surroundings were far from luxurious and the couple were overrun with insects and suffered greatly in the humidity of Rio. However, the couple persevered and had seven children together, three of whom survived childhood. In 1822 Leopoldina the first Empress Consort Brazil had known and proved herself a keen political maneuverer. With her husband away in São Paulo, she served as Regent and led negotiations in favour of Brazilian independence. She wrote to him with her findings and thoughts and he accepted her reasoning, declaring the independence of Brazil on 7th September 1822. Four years later Pedro inherited the Portuguese throne upon the death of his father, holding it for just two months until he abdicated in favour of his seven-year-old daughter Maria. That same year Leopoldina died in Rio de Janeiro, after complications from a miscarriage. On another note of interest, her grandmother was Maria Theresa the only female ruler of the Hapsburg dominions and one of her aunts was Marie Antoinette. I wonder if what happened to her aunt in any way influenced her thoughts on independence and ruling. Ah, a very interesting angle... You have set me thinking now!